I can't stop myself to buy when I see fresh corn in the market.I love to grill it and eat it hot and spicy with fresh lime and masala smeared all over it.One corn was left over in the refrigerator untouched after having a over dose of grilled corn.So,thought of using it in a curry and as I had spinach in hand thought of mixing them both.I actually grilled the corn and marinated it with lemon and salt and the idea actually worked,it gave a nice taste to the corn in the curry.As I had only one corn I even added paneer to make it sufficient for both of us.The crunchiness and tangyness of corn in each and every bite is really amazing and I just loved it. Boil water in a big pot and add cleaned spinach leaves and whole green chillies and blanch for a minute.Add a pinch of sugar while blanching it in order to retain the green color of spinach.Strain the spinach(save the water to dilute the gravy later) and quickly run the blanched spinach under running water and squeeze out extra water.You can even saute the spinach but you should be really quick in doing it otherwise you will loose the beautiful green color of spinach. In that hot water(in which we blanched the spinach)soak the paneer cubes until its uasge.This way the paneer will be soft. Grill the corn on the flame until light black spots appear all over the corn.Quickly rub it with lemon wedge dozed with salt all over the corn and let it marinate for some time,aproximately 10 mins.Take a knife and cut the corn to get the corn kernels. Grind diced onion with ginger and garlic paste and keep it aside. Grind the spinach and green chillies to a fine paste.Open the mixer and keep it,otherwise it will change the color. Heat oil and butter in a big kadai and crackle cumin seeds,add finely chopped onions and fry until translucent and add ground onion mixture and fry well. Add coriander powder,cumin powder,amchur powder,slightly crushed kasuri methi and mix well. Add spinach puree and cook over medium flame.Add salt,grilled corn kernels,paneer cubes(slightly squeeze them after removing from hot water) and garam masala and mix well.If required add the strained water to dilute the gravy to get the required consistency and ook for 2-3 minutes.Do not cover the kadai while you are cooking,otherwise you will loose the green color of spinach. Add cream(or milk) and mix well and cook for a couple of minutes and remove it from stove.Add lemon juice and give a quick stir. Serve it hot with roti/kulcha/naan/jeera rice. You can just make this with grilled corns and call it Grilled Corn Palak or you can use only paneer and call it Palak Paneer as the recipe is almost same for both of them. I do not add tomato in any of the spinach based dishes as I some how believe the combination of spinach and tomato leads to the formation of stones in kidney.So I avoid tomato and use instead amchur powder or lemon juice for the sourness. This is going to participate in Sara's "Only Greens" event started by Pari of Foodelicious. wonderful looking n very delicious ! I am in luv with this green curry. It looks so rich and creamy. Looks yummy and delicious. Thanks for the entry dear. wow.what a colour.. really lip smacking tasty paneer dish. Hi..first time here....paneer dish looks yummy. 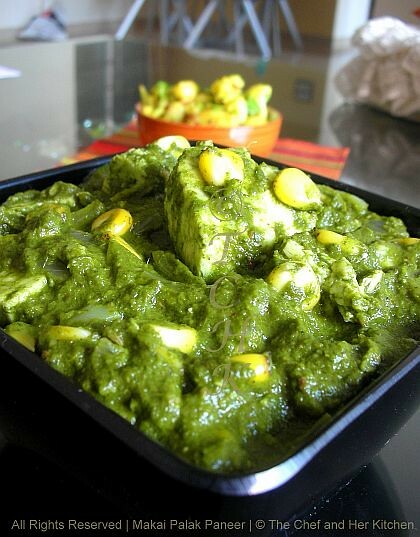 All my favourite in a dish, very inviting palak paneer corn gravy..very tempting..
Wow! The dish is healthy and tasty! Slurp! bookmarking this....looks just so tempting and yummy! Wow such a nice combo, all my fav ingredients in one dish..love it! hi. I love this combination and your curry looks awesome. Personally even I never add tomatoes with spinach as I feel it completely changes the taste of Spinach and lemon compliments it well. The color is popping out from the screen. What an unusual combination and delicious too! 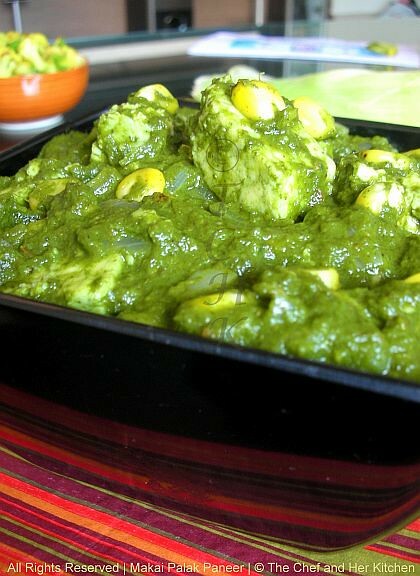 Lip smacking paneer curry..love the inviting green color. wow, i have never tried adding corn, its a wonderful twist! nice recipe. Looks very inviting... I especially like the fact that you used those corns that looks so delectable. Lovely curry with healthy palak n corn n paneer . awesome! I add tomatoes to palak paneer. For normal palak palya I add lemon juice. That gravy looks tempting. I recently make palak paneer. Will try your way next time. 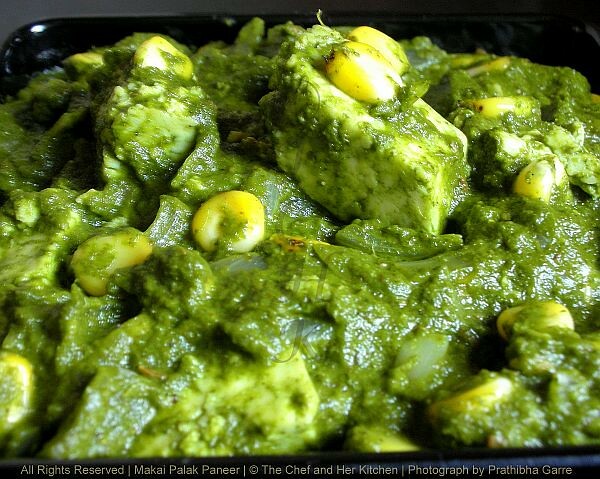 Makai in palak paneer sounds great combo,should be yummy! The palak paneer looks really delicious and that's a nice corn twist. I cooked palak paneer todaym never thought to add corn. Nice touch! Hi I tried you green peas kachori and they came out awesome. Am awaiting your chole Bature Recipie.. Thanks so much for the detailed steps that are easy to follow along with the photos and the related articles. Good show.